When it comes to polarizing styles, few things come to mind quite like animal print. There are those who love it both for its unapologetic opulence and quirky motifs. Equally, there are those who have permanently relegated it to the past, along with other ’80s relics whose ranks include neon. We fall into the former camp: When done right, animal print embodies old-school elegance, adding a refreshing breath of fresh air to a space in the process. And what better way to make a statement with this luxurious style than via animal-print wallpaper? Lately, we’re seeing interest spike for a specific iteration of animal print: pieces that feature entire animals rather than co-opting their patterns. For the bold-minded, there’s tiger print, which has been enjoying a moment in the spotlight thanks to brands like Gucci and Hermès. A recently launched furniture collaboration between The Inside and storied fabric brand Scalamandré also invites decorators to incorporate animals into their homes in myriad ways—a zebra-print headboard for the more maximalist among us and leopard-laden decorative throw pillows for a smaller dose of drama. Big or small, animal prints are particularly well-suited to wallpaper because of how eye-catching they are and how little they require in terms of complementary decor accessories. Even the tiniest room in the world would look stunning with animals adorning its walls. From the luxurious to the whimsical, here are a few of our favorite wallpapered spaces proving that animal print can be done tastefully—plus, the best papers to help you bring this playful style home. Embrace old-school elegance in a real way with one of the most historically luxe motifs out there: Chinoiserie. Rich mauve on silver gilded paper makes this de Gournay–wallpapered room showstopping, but for a more budget-friendly version, opt for Tempaper’s equally sophisticated pale blue version. Even if you only use it on one wall in your bedroom, it’ll pack a real decorative punch. Gucci’s Heron wallpaper has been the cool kid of the wallpaper world for quite some time now. The perfect combination of unapologetic luxury and playfulness—six-foot-tall herons are not the most demure—the pink wallpaper is great for those not afraid to go bold. Try the real thing out in your dining room to turn a traditionally formal space into something a bit more fun. 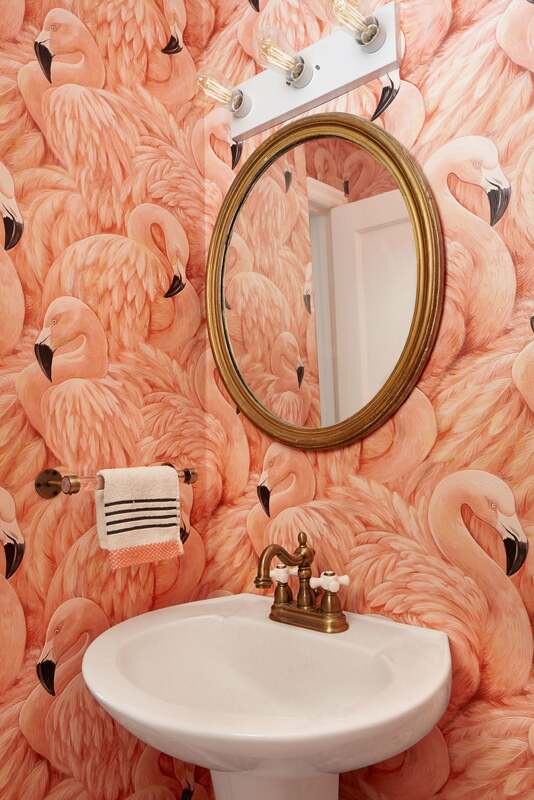 This vibrant flamingo wallpaper is Florida kitsch in the best way. It’s a minimalist’s nightmare and a maximalist’s dream. Designer Michelle Gage used it to dress up a tiny powder room; we think the similar bird-emblazoned Lulu and Georgia print would look equally fun in a nursery. Who says kids’ rooms need to be boring? If leafy botanicals aren’t quite the jungle motif you’re going for, take a walk on the wild side with a leopard wallpaper. Use it on your walls for a bit of drama or use it to spruce up an old furniture piece in need of a modern makeover. Maybe your coffee table tray needs a new surface or maybe your IKEA bookshelf could use some zest—either way, this animal print definitely makes a statement. Animal print is a generally striking effect—one that’s full of color and careful detailing—but the daring look isn’t for everyone. Opt for a black-and-white wallpaper that’s lighter, more whimsical, and almost looks like a sketch doodle. Urban’s simple cat wallpaper looks hand-drawn, and it’s actually removable, making it the ideal choice for someone who wants to tiptoe into the animal print trend but isn’t 100 percent sold on the style. Dee Murphy says this bird wallpaper actually inspired her entire dining room design, and we can see why. It’s just whimsical enough to be the focal point of the space but isn’t so “out there” that the rest of the room clashes. This Andrew Martin print offers a similar vibe: The animals are smaller, so they’re easier to style with the rest of your space, but the pattern makes for a colorful, vibrant wallpaper. It would look sweet in a kids’ room or it would work as an accent wall in your dining room.